Advanced Office specializes in finding Corona companies the best print and workflow solutions to suit their unique circumstances, printing needs, and budgets. Unlike other Corona area copier and printer dealers who might be focused on selling you the most expensive copiers and printers, we are invested in building a long-term relationship with our clients through honest recommendations, competitive pricing, and high-quality products and service. This methodology has been the key to our success: We have been in business for over 30 years, accrued over 30,000 satisfied clients, and are leading Ricoh and Lexmark dealers. 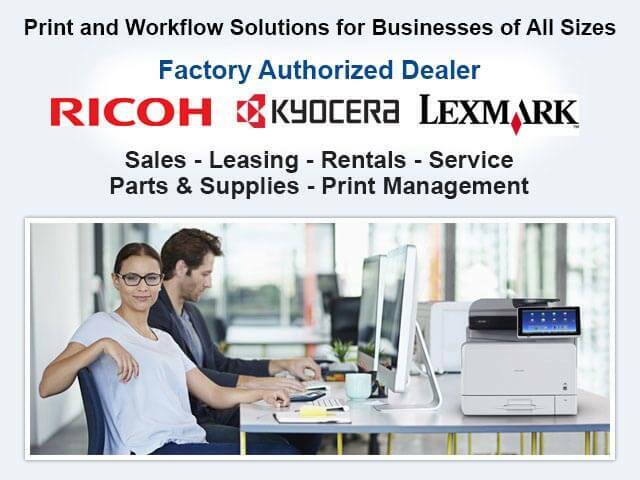 As authorized Ricoh and Lexmark dealers, Advanced Office is trained and certified to sell, lease, install, and service all of their commercial products. 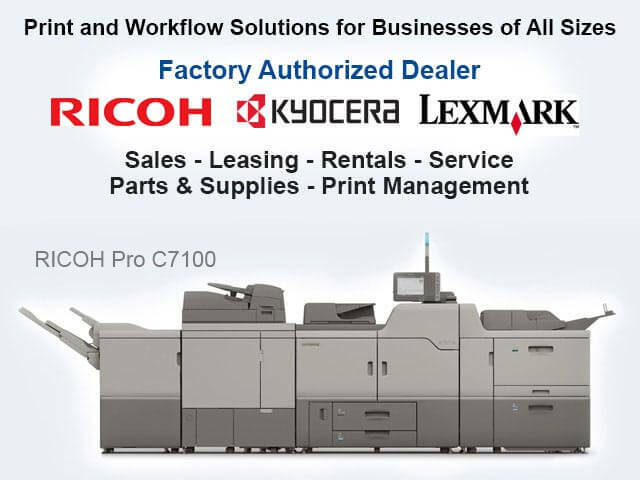 Our inventory includes Ricoh and Lexmark printers, copiers, digital duplicators, wide-format printers, production printers, and fax machines--all available at highly competitive prices and with a variety of financing options. We also offer a variety of refurbished copiers and multifunction printers (MFPs). Additionally, we design and implement custom software solutions to help businesses from any industry reduce their print-related costs, better manage their documents, and improve their workflow efficiency. Call today and speak with Advanced Office's expert sales team about custom print and workflow solutions for your Corona business. We'll provide you with a free onsite comprehensive analysis at a time that is convenient for you and your colleagues. 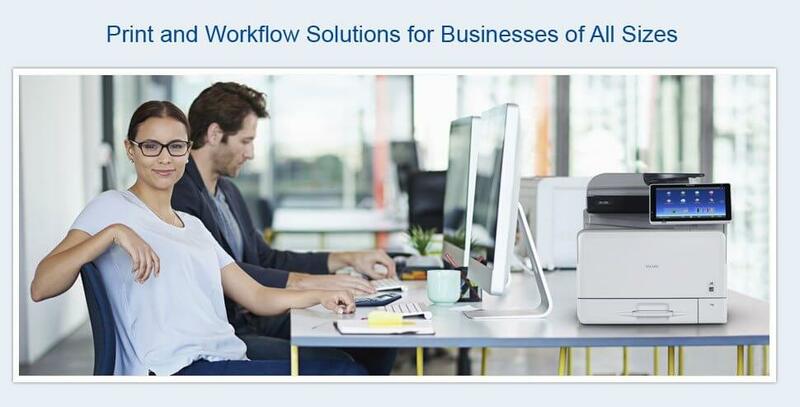 By working with Advanced Office, your Corona business will get access to Ricoh's exceptional copiers, printers, digital duplicators, wide-format printers, production printers, and fax machines. Ricoh is the #1 U.S. market shareholder. They are dedicated solely to office automation products, and are a two-time winner of the Deming Prize for their commitment to quality. Ricoh is also exceptionally committed to sustainability: All of their plants are zero waste to landfill, and they have been named among the "Global 100 Most Sustainable Corporations" and one of the "World's Most Ethical Companies." The Ricoh brand includes the highly respected brands Savin, Gestetner and Lanier. Advanced Office is the top-ranked Ricoh dealer for the Western Region and the 12th ranked Ricoh dealer nationwide. This means that Advanced Office has the purchasing power to offer Corona clients the best rates for Ricoh, Savin, Gestetner, and Lanier products. Additionally, with four offices located throughout Southern California, we can provide dedicated local service. We sell and lease Ricoh's complete line of commercial office equipment and also maintain an inventory of refurbished Ricoh copiers. Call us today for a free consultation. Our experts are readily available to visit your worksite and determine the best copier and printer solution for your needs. Corona businesses choose Advanced Office when they need to buy or lease a fleet of Lexmark printers or copiers. Lexmark is a U.S.-headquartered printer and copier manufacturer that excels at producing industry-specific print and workflow solutions. Their A4 products offer unparalleled speed for the price and footprint. Year after year, Lexmark's printers and copiers have won numerous BLI (Buyers Lab) Pick Awards, which is an indication of the great performance Corona businesses can expect from these highly engineered products--it's why Lexmark is the first choice among 75% of the world's top retailers, pharmacies and banks. Advanced Office is proud to offer Lexmark to our Corona clients that need a fast, highly reliable, and cost-effective machine. We've provided thousands of businesses with competitive pricing on Lexmark whether they were looking to buy or lease. We also provide Corona with unsurpassed copier and printer service and maintenance which helps keep warranties valid, extend the life of your machines, and reduce the likelihood of unexpected breakdowns. If you are wondering if Lexmark is right for your work environment, call us today for a free onsite analysis. At Advanced Office, we have more than three decades of experience in helping Corona businesses determine which copier will best suit their needs and budget. By administering a complete workflow analysis that consists of interviewing your key users, evaluating your current office equipment, and understanding your print and document management needs, we are able to recommend one or more copier models that will meet your needs and fit your budget. We've helped thousands of businesses across Southern California find the best copier for their needs and we know we can help you too. We exclusively sell, lease, and rent Ricoh and Lexmark copiers because we believe they offer our Corona clients the best value in copiers and printers. Their award-winning machines offer incredible print quality, fast printing speeds, highly durable components, and models for businesses of every size. We offer both new and certified refurbished copiers. Call today to speak with one of our copier sales experts. We'll come out to your Corona business site and provide honest, professional advice and expert recommendations. 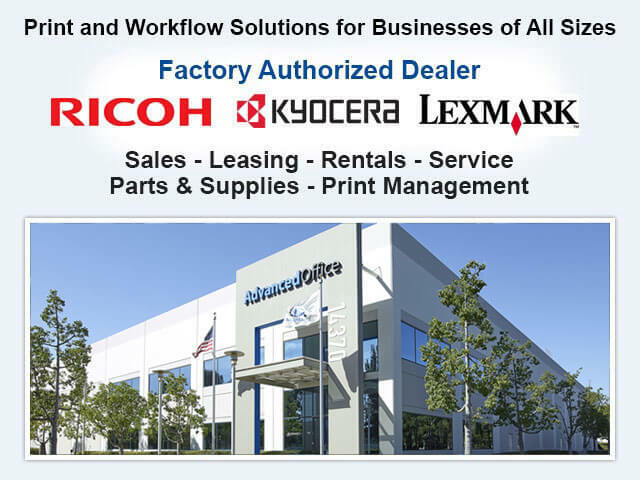 Advanced Office sells and leases high-quality printers made by Ricoh and Lexmark to companies throughout Corona. Our inventory includes black and white, color, and combination laser printers for commercial use. Our printers can produce quality prints quickly with a low cost per page. When our clients also invest in routing software, printing costs can be reduced even more. By working with our printer experts who average nearly 14 years of experience, your fleet of printers can be strategically placed and set up for optimal cost savings and productivity. We have direct access to Ricoh and Lexmark's printers and often can have printers delivered, installed, and connected to your network faster than any of our competitors. Call today for a free onsite printer consultation in Corona. Advanced Office specializes in finding the best print solutions for Corona's local businesses. For our clients that want to print, copy, and scan oversized documents in-house, we recommend Ricoh's line of wide-format printers. These specialized professional machines can print documents, such as floor plans, posters, schematics, and drawings that are up to 3 feet in width and 49 feet in length. And, like all Ricoh products, these wide-format printers are renowned for producing prints with superior resolution in a very short amount of time. Call Advanced Office today to discuss our Ricoh wide-format printer purchasing and leasing options. We offer 100% financing with low interest rates that include the cost of the equipment, an all-inclusive service and supply agreement, and specially tailored software to improve your business operations. Ricoh's digital duplicators are the perfect heavy-duty machine for nonprofits, hospitals, schools, universities, and other businesses in Corona that need a low-cost way to generate huge quantities of single-page documents. At Advanced Office, we sell, lease, and install digital duplicators and are factory-trained to provide the highest quality service and maintenance. Call today to learn more about how a new digital duplicator can improve print-related productivity at your Corona worksite. 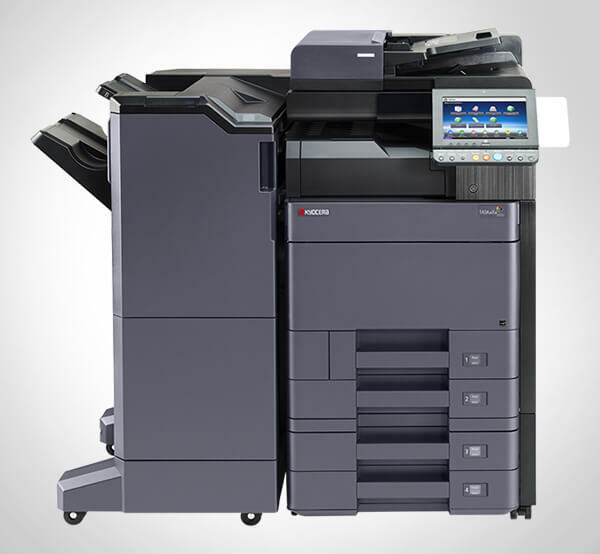 Advanced Office has years of experience leasing and selling Ricoh production printers to companies in Corona. We offer them superior-quality production printers at cost-effective prices with 100% financing options. These printers are the best option for businesses that wish to create an in-house print shop. Production printers produce huge volumes of quality prints quickly and affordably. Additionally, they can also feature a variety of advanced finishing features, such as stapling, collating, multiple folding, saddle stitching, hole punching, and more. While you can go to any Ricoh or production printer serving the Corona area, Advanced Office is the company that has the expertise and experience to determine the precise printer for your company that will not only meet your needs but offer you the best cost advantage. Call today for a free onsite analysis. 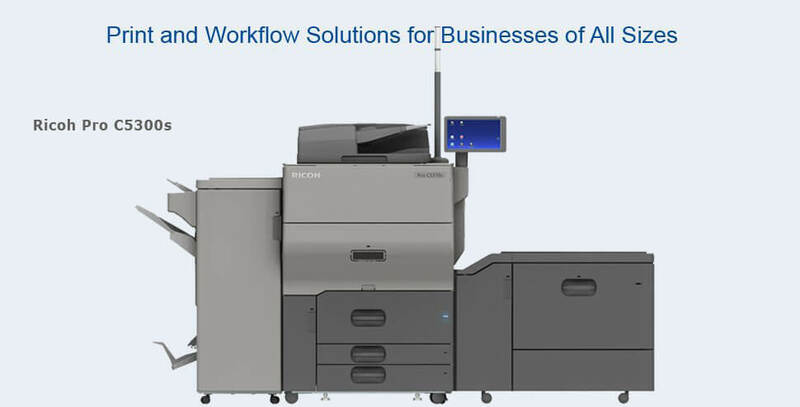 Advanced Office offers Corona businesses software solutions for copiers and printers to further improve their workflows. Our software expertise extends to document management, distribution, capture, and storage; security; billing solutions; rules-based printing; and more. Advanced Office has an in-house IT team that can design and install both custom and turnkey software solutions for businesses in any industry with any brand of office equipment. Our professional software services are always competitively priced and are eligible for financing. Call today for a free consultation. Just prior to the Christmas break, Kaye Monachelli had the rather large task of delivering 73 duplicators to our 30+ school sites. Expecting many problems, it was refreshing to know that the entire . . .